Aims: Rheumatoid Arthritis (RA) is a chronic inflammatory disorder, where incidence and severity of myocardial infarction are increased. Data on the incidence and outcome of stroke are conflicting. 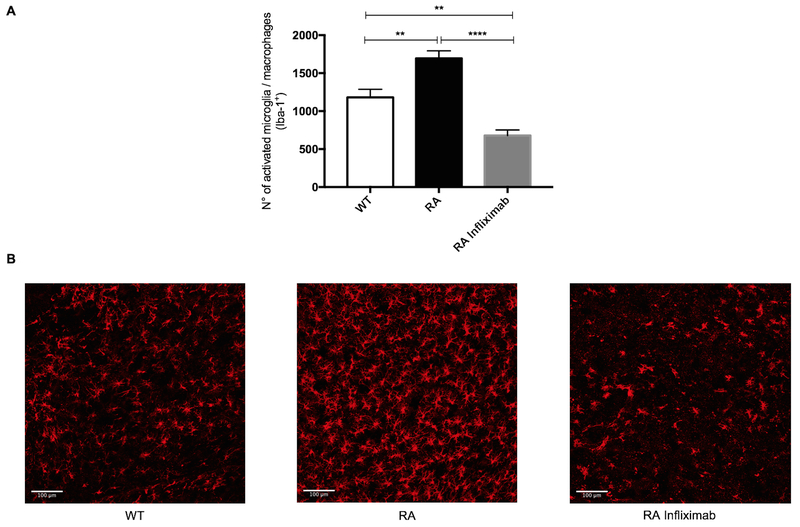 Thus, we investigated outcome after Ischemia/Reperfusion (I/R) brain injury in a mouse model of RA and assessed for the role of the tumour necrosis factor-a (TNF-α) inhibitor Infliximab herein. Design and methods: We used a TNF-α reliant mouse model of RA. RA and wildtype (WT) animals were treated with vehicle (RA/WT) or Infliximab (RA Infliximab) for 4 weeks, before undergoing I/R brain injury. Stroke size was analysed by TTC staining. Blood brain barrier (BBB) permeability; tight junction protein (TJP) expression; matrix-metalloproteinase (MMP) expression; lipid peroxidation and counts of microglia and invading macrophages were assessed by immunohistochemistry. Results: RA-animals displayed larger strokes and poorer neurological performance (Fig.1). Immunohistochemistry on brain sections revealed increased numbers of resident and peripheral innate immune cells (microglia and macrophages) (Fig.2); increased BBB-disruption; decreased levels of TJPs claudin-5 and occludin; increased expression of MMP-3 and -9 and enhanced lipid peroxidation. Treatment with Infliximab corrected these alterations. Conclusions: We show that RA associates to worse stroke-outcome via exacerbated BBB degradation by decrease of the TJPs claudin-5 and occludin. We identified MMPs-3 and -9 and increased oxidative stress as potential mediators thereof. Increased numbers of resident and peripheral innate immune cells (microglia and macrophages) may in turn contribute to all these effects. 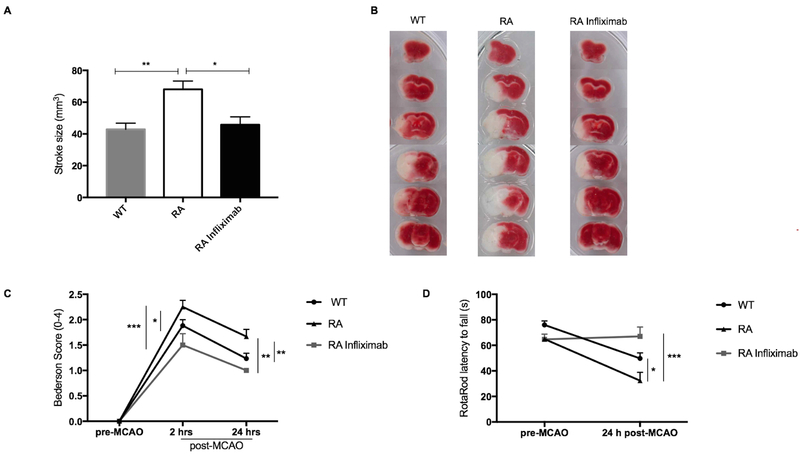 Infliximab-treatment restored the phenotype of RA-mice to baseline. Our data provide evidence clearly linking RA to adverse stroke-outcome in mice and indicate an approved TNF-α inhibitor as a potential strategy to reduce stroke-burden in this setting.